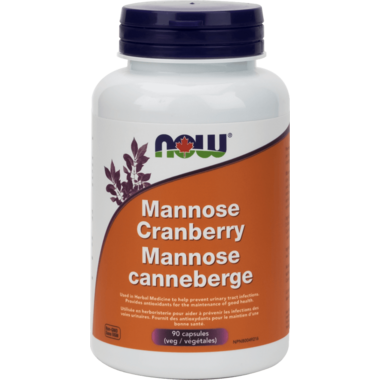 NOW Foods Mannose Cranberry is a combination of two ingredients known to support urinary tract (UT) health. Both Mannose and Proanthocyanidins (PACs) (the main active constituents from Cranberry) exhibit anti-adhesion activities in the UT and help to maintain a clean waste stream. Directions: Adult Dosage: Take 1 capsule twice daily. Use for a minimum of 4 weeks to see beneficial effects. Non-Medicinal Ingredients: Veg Capsule (hypromellose, water), Silica and Magnesium Stearate (vegetable source). Caution: Consult a health care practitioner prior to use if you are pregnant or breastfeeding, if you have a history of kidney stones or if you are taking blood thinners. Ensure to adequately hydrate before, during and after exercise. Consult a health care practitioner if symptoms persist or worsen.